Angular is a full-featured framework that was released in 2010 by Google, and they keep releasing updates regularly. For example, in March 2018, the latest Angular 6 brought a bunch of improvements including a new rendering engine for faster and smaller applications. 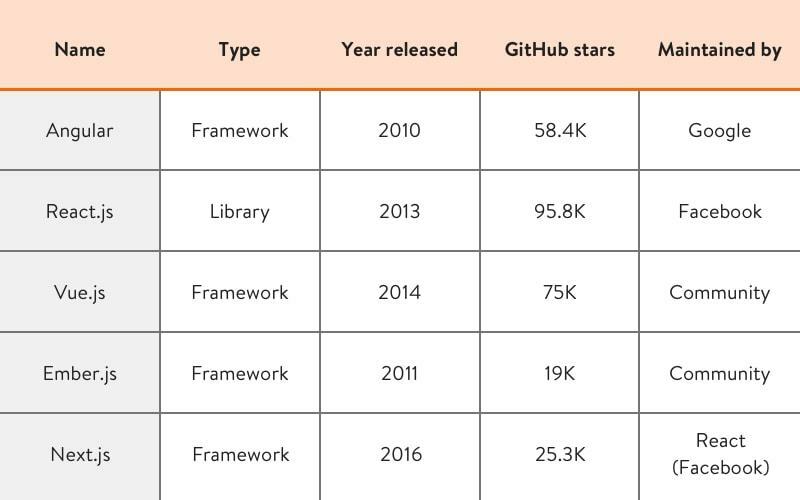 Today, Angular is one of the most popular frontend frameworks. Many developers choose Angular because they see it as a key to simplifying development. 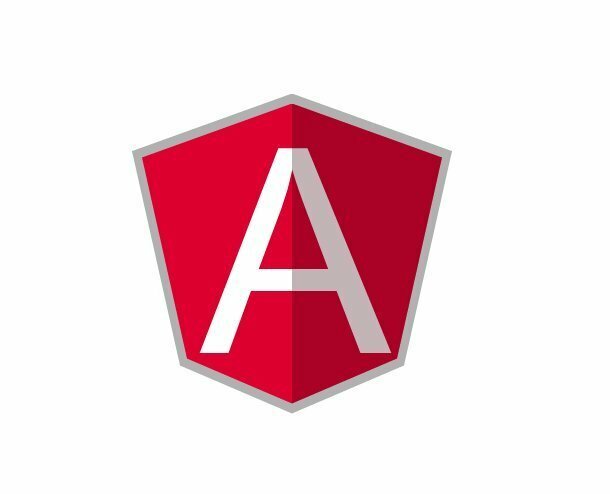 Due to its templates, frontend specialists can easily use Angular to create dynamic single-page web apps with lots of changing data. Moreover, Angular has a Model-View-Controller (MVC) architecture, which makes testing easier and more approachable. 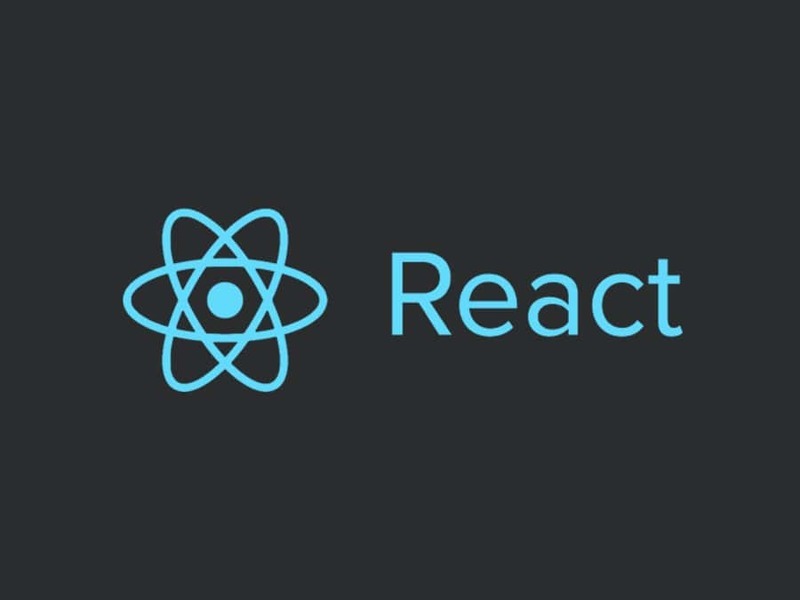 React.js is a framework released by the Facebook team in 2013. Big companies including Dropbox, PayPal, the BBC, Atlassian, and Instagram use React as a basic frontend tool. React is perfectly suited for apps and websites with complex view logic. React also allows reusing components within an application so developers don’t have to create similar components again and again. With React, developers can focus on creating complex features. Due to a special reconciliation algorithm called the Virtual DOM, frontend developers receive a significant performance boost. They can develop faster since they don’t have to update views because of each small change. The Ember.js framework was created in 2011. It’s been used to design websites for many well-known companies including Kickstarter, Heroku, and LinkedIn. Ember.js gets regular updates and provides a full package of features. The framework is effective for developing complex web applications, and its string-based templating system contributes to faster boot times. Ember.js is focused on scalability, so developers can easily work with both mobile and web projects. 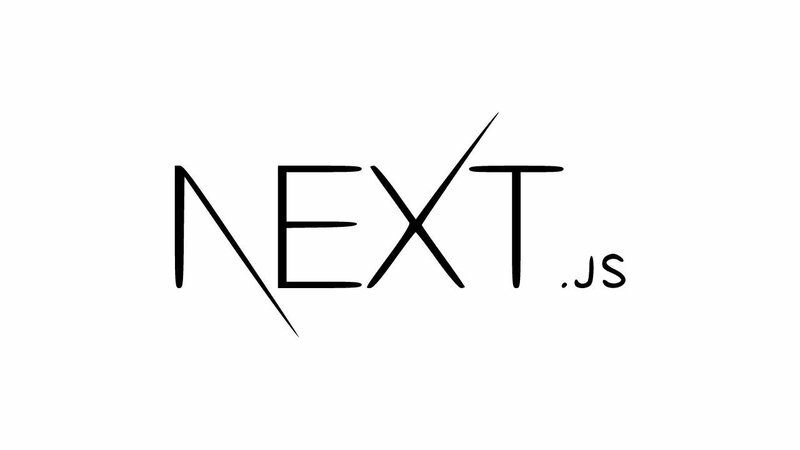 Next.js has remarkable features such as automatic code splitting and page-based client-side routing. Moreover, Next.js has full CSS support, called styled-jsx, to make user interface styling much easier. The choice of the perfect framework for building a UI should always depend on a project’s specifics and a developer’s skills, however. Now we’ll tell you about what our frontend developers choose at Yalantis. Effective component-based system. Components and directives have replaced controllers and scopes as the major building blocks of apps. Component classes are separate units, which makes them reusable and easy to add to existing applications. Two-way data binding. This feature reduces the time required for coding. Developers can make changes in models and views in one step without waiting until UI elements are rendered. TypeScript. Angular learning resources and documentation are based on TypeScript, so it’s difficult to avoid it. TypeScript may seem challenging to some developers, but there’s nothing bad about it. Many new features become available for TypeScript much faster than for the other languages. Moreover, TypeScript provides object-based programming patterns and optional static type checking, which is useful for large-scale applications. Simple documentation. All the official Angular documentation is short and simple so even developers with little experience can quickly learn the basics. Strong community support. The Angular framework is a Google product, so obviously it has many fans and supporters. Developers can easily find lots of tips on blogs and forums. To summarize, the Angular framework is a top tool for frontend development, providing lots of features. Both businesses and developers profit from creating applications with Angular. First of all, Angular is maintained by Google, so the framework gets regular updates and features are constantly improved. Second, unlike many other frameworks, Angular is available under the MIT license. For businesses and developers, it’s important to use licensed tools since they’re more reliable. Boosted performance. React has a unique feature called Virtual DOM that boosts the efficiency of coding. When developers make small changes, they don’t have to update a whole view. The changes go through the Virtual DOM, which re-renders only the necessary part of the page. This approach takes less time and saves developers’ efforts. React rendering. 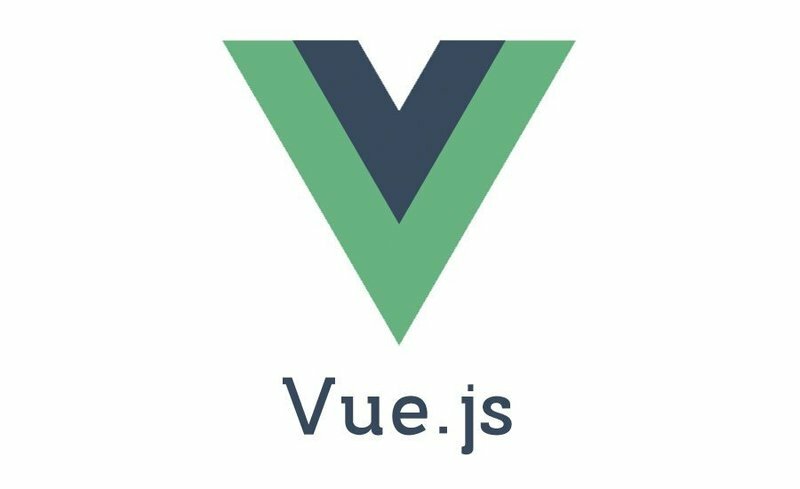 React is a perfect tool for view rendering. It allows you to render your page on different platforms including websites, native apps, and VR apps. Reusable components. React, just like Angular, has a component-based architecture. This means that using the React framework, developers can consider components as building blocks of the application. The biggest advantage of this is that ready-made components can be used in different parts of an app so developers can build apps much faster. Facebook and community support. React is curated by one of the tech giants—Facebook. The Facebook team knows how to deal with complex web apps, so the React framework is focused on boosting performance. React’s community is one of the biggest among popular web frameworks for frontend development. There are many blogs, plugins, and SDKs related to React, so in case developers have any problems with the framework they can easily find answers on the internet. All in all, the React framework is an effective tool for user interface development. Its functionality enhances development by reducing time spent on coding, which is a great benefit for businesses and developers. Moreover, React is easy to learn, so developers can start using it without preparing. Finally, it has great support from the community and Facebook, so the framework will definitely receive updates and new interesting features.